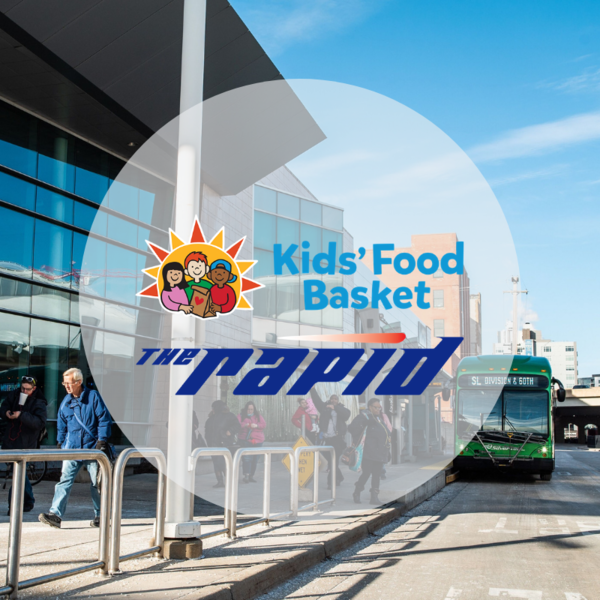 The Rapid is proud to partner with Kids’ Food Basket to provide emergency food assistance to families impacted by the extreme weather. Rapid Central Station, along with the YMCA of Greater Grand Rapids, Seymour Christian Reformed Church and Kids’ Food Basket will be distribution sites for food on Thursday, Jan. 31 and Friday, February 1, from 11:30 a.m.-2 p.m.
“During severe weather events like this one, we all have to pull together to meet the critical needs of our community. We’re glad Kids’ Food Basket reached out and are happy to support their efforts,” Andrew Johnson, The Rapid CEO. The David D. Hunting YMCA, 475 Lake Michigan Dr. NW, Grand Rapids, Mich. Families visiting the downtown YMCA location can enter through the main entrance and follow the signage to the community room to receive your meal. The Rapid Central Station, 250 Grandville Ave SW, Grand Rapids, Mich.
Seymour Christian Reformed Church, 840 Alger St SE, Grand Rapids, Mich.
Kids’ Food Basket, 2055 Oak Industrial Drive, Suite C, Grand Rapids, Mich. Anyone wanting to help can click here for more information.